Grand Park’s landscape architecture and architecture by Rios Clementi Hale Studios creates a distinctive, interconnected, and inviting space. The design is inspired by the diversity of the people of the region, both explicitly and implicitly, in the variety of its lawns, terraces, plazas, and gardens. 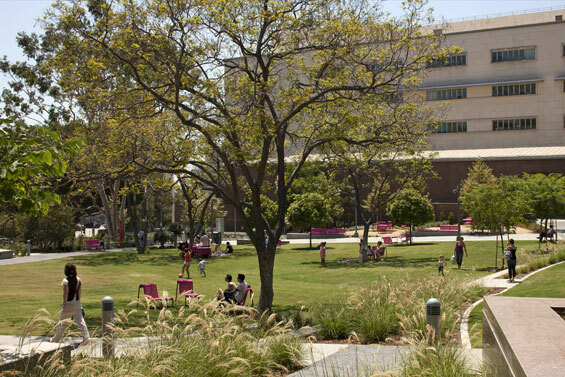 Although Grand Park is a significant marker of the county, it is not meant to be a static monument, but rather act as the “front- and backyards” for the community. 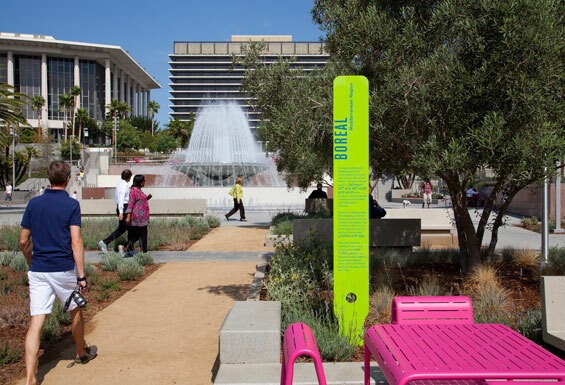 It is a public garden that reclaims a key urban site to celebrate the Los Angeles County of yesterday, today, and tomorrow. 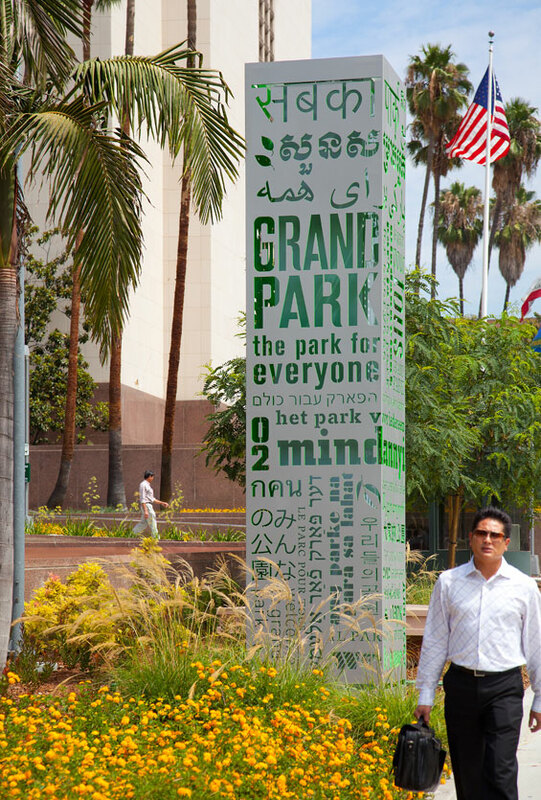 Grand Park is a distinctive space designed to “feel” like Los Angeles, with its lush and diverse vegetation echoing the region’s numerous backyard gardens, as well as open lawns, gardens, bright-magenta furniture, and shady spaces to see and be seen. Many overt and subtle elements of Grand Park emerge from the overall structure of the plan, which alludes to the Goode Projection—a composite map projection used for world maps—and its curving lines known as “meridians.” This idea is manifested in the gently curving meridian paths that join the north and south promenades, and conceptually extend—via cross streets—into downtown areas, including Chinatown to the north and the city’s historic core to the south. This feature of the layout signals the dispersed geography of Los Angeles County and the rich diversity of its population. 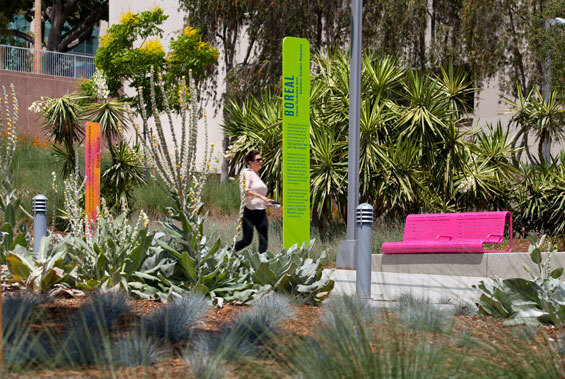 Also emphasizing world cultures are the floristic gardens and the environmental graphics program (designed by Sussman/Prejza & Company) that includes entry totems welcoming visitors in 25 languages that are found on Los Angeles County voter registration materials. 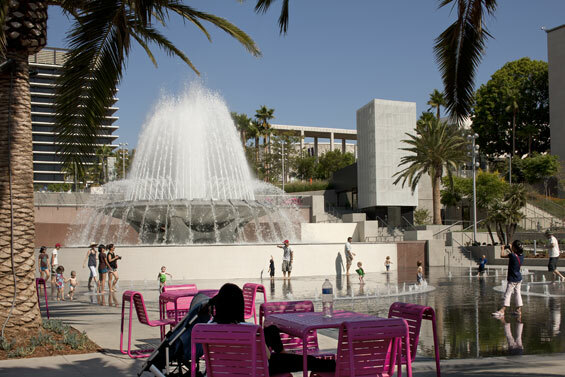 Different activities occur in Grand Park’s four public spaces, or “blocks.” In Blocks One and Two (opening July 2012), visitors will find the Fountain Plaza with the regal, restored Arthur J. Will Memorial Fountain and interactive water features (by Fluidity Design Consultants); new buildings, which house the park office and public restrooms; Olive Court, a plaza that marks the historic alignment of Olive Street with olive trees and Mediterranean plantings, as well as historic speaker poles and benches; and the Performance Lawn with broad expanses of grass and a small stage. This shady lawn area incorporates several existing Jacaranda trees and is surrounded by various gardens containing plants from North America, Australia, and Southeast Asia. In Blocks Three and Four (opening fall 2012), visitors will find the Community Terrace, a large central plaza surrounded by gardens from each of the world’s six Floristic Kingdoms; small lawn areas for picnics and lounging; a Flag Garden; the Broadway Terraces, providing ADA access down to the street level, as well as informal steppedseating areas; the Event Lawn, an open, flexible area for large public gatherings and marketplace; and even a dog run. Wide steps—along with ADA-accessible ramps, switchback paths, and the landscape architect’s reworked grades—mitigate Bunker Hill’s 90 feet of grade change throughout the length of the park. The floristic gardens, a crucial element of the design, beautify the park in concert with nearly 150 of the site’s existing mature trees, 50 of which were removed during construction and returned to the park and re-planted. The diverse plant palette stems from the organization of the world’s six Floristic Kingdoms—South African, Boreal, Australian, Neotropical, Paleotropical, and Antarctic. While these regions have occurred due to specific environmental factors, Los Angeles provides a climate of easy adaptation for the various plant communities of the world to come together. 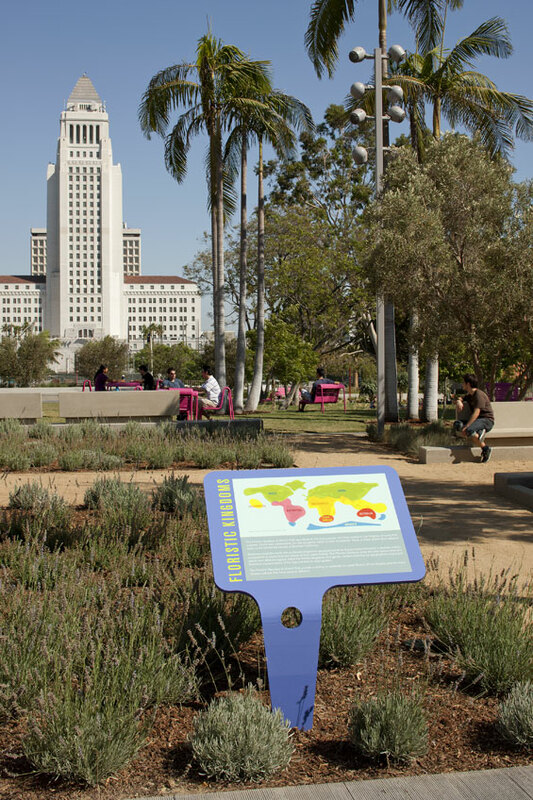 This great global pageant of plants also pays tribute to Los Angeles’ wonderfully diverse population. 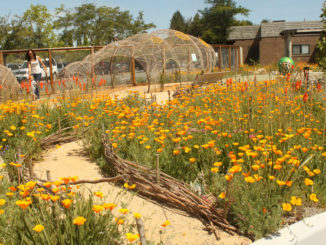 Intermingled with native plantings, species from the various regions are organized into gardens that are distributed along the length of the park. Garden markers (designed by Sussman/Prejza & Company) resemble oversized garden stakes and indicate the region, describe the climate, and talk about the specific characteristics of a featured plant within each garden. 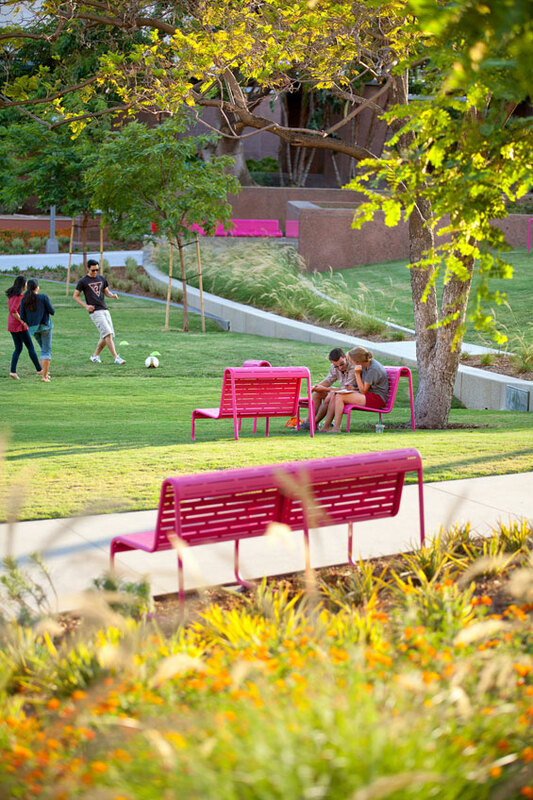 Magenta site furnishings throughout the park invite visitors to linger, enjoying its vibrant display. The vibrant color was chosen to act as a year-round “bloom” that complements the seasonal colors of the gardens. One of the greatest improvements that immediately engages the public is the new terraced entry to the park from Grand Avenue. 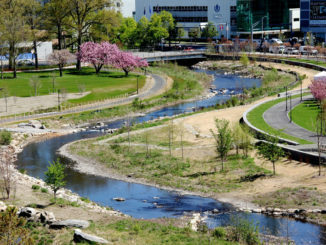 Once both physically and visually inaccessible due to the large circular parking ramps providing access to the garage below, the park now flows naturally from Grand Avenue’s sidewalk to the Fountain Plaza nearly 30 feet below. The Fountain Overlook offers a view of the restored fountain, new splash pad interactive water feature (by Fluidity Design Consultants), and the surrounding plaza. Gardens in this area include plantings from the Boreal floristic kingdom, such as the Albizia julibrissin (Persian Silk Tree). A new park building on the south side includes public restrooms under a sloping roof, while another building on the north side accommodates the park office, public elevator, and support spaces. 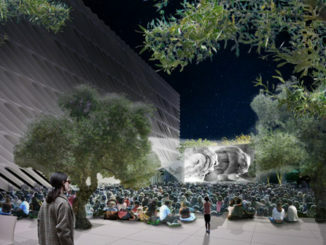 Moving east and traversing the Olive Court—a plaza space that marks the historic termination of Olive Street with Olive trees and Mediterranean plantings, as well as historic speaker poles and benches—one finds the Performance Lawn. This shady lawn area incorporates several existing Jacaranda trees and is surrounded by various floristic gardens containing plants from North America, Australia, and Southeast Asia, such as Cercidium “Desert Museum” (Palo Verde), Melaleuca nesophila (Pink Melaleuca), and Bauhinia blakeana (Hong Kong Orchid tree). Across Hill Street is the Community Terrace, a large central plaza surrounded by gardens from each of the world’s six Floristic Kingdoms. The Court of Flags has been re-organized into a new Flag Garden overlooking the Event Lawn and City Hall. The Broadway Terraces provide ADA access down to the street level, along with informal steppedseating areas for relaxing and viewing events at the Event Lawn. Across Broadway and facing City Hall is a broad expanse of grass that comprises the Event Lawn, north and south promenades, the much-anticipated dog run and the multi-use Marketplace on the south.